PX4-STORM pistol, designed and manufactured by FABBRICA D'ARMI PIETRO BERETTA SpA, Gardone Val Trompia, Italy, is a selfloading full-size combat handgun engineered for Military/LE PDW purposes, and for the civilian market. It works in SA/DA, it's recoil-operated, and has a polymer frame and a steel slide-barrel group. The barrel is roto-traslating to reduce the recoil, just like in the Beretta "Cougar" pistol series, of which the PX4-STORM is a further advancement. The steel-made barrel and slide represent about 80% of the total weapon weight, however the pistol results in being even lighter than 1 Kilogram, with a full-capacity magazine inserted. It has three safeties: a trigger safety on the frame, a decocking lever on the left side of the slide, and a hammer safety on the right side of the slide. The two safety levers on the slide have been re-designed to avoid their accidental activation while operating the slide, which happened often with the "Cougar" pistols. Furthermore, the entire weapon design has been engineered in order not to clench in clothes or holsters and thus to achieve fast drawing and ready usability by everyone, in plain clothes or uniform, carrying the gun open or concealed. The weapon has been recently introduced at the ADIHEX defense expo ad ABU DHABI (United Arab Emirates), and will be available in the 2005/2006 period; by beginning 2005 the weapon will appear on the market, by the end of 2006, all of the three versions of the weapon, in three different barrel lenghts and in several calibers, will be available; BERETTA is already taking deposits and pre-orders anyway for Military and Law Enforcement agencies only. Other than the PX4-STORM standard version pictured in the previous post, there will be a shorter barrel PX4-STORM "Compact" and a sub-compact "Micro-PX4 STORM". About calibers and ammo capacity, by now I only have informations about the standard version. Calibers available: 9x19mm-Parabellum (for Military/LE calibers and for export outside Italy); 9x21mm-IMI (for Italian civilian market); 40-S&W; 45-ACP. Magazine capacity: 17+1 rounds (.9x19mm and .9x21mm); 14+1 rounds (.40-S&W), 11+1 rounds (.45-ACP). 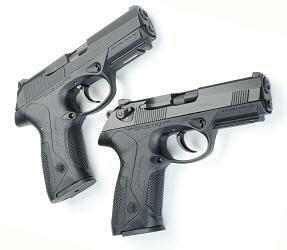 The weapon is purported to phase completely out the unsuccessful M9000-S compact pistol in the Beretta production, at least for the Italian civilian market (probably the M9000 will be produced only in the ACCOKEEK, MD, USA plant); furthermore, there are no plans to replace the M92 series, nor to halt its production: in fact, in the 2005 SHOT Show, the BERETTA PX4-STORM will be introduced along with a new pistols series called the "90/Two", rumors say that this series will be a major advancement in the M92 system (probably there will be an M92-FS with improved ergonomics and even in .45-ACP, this will make many Yankees happy).